BNSF will study whether covering cars can keep coal and dust from blowing off trains. A few years back, volunteers working with the Spokane Riverkeeper walked under railroad bridges and trestles in Spokane, searching for coal that might have fallen from passing trains. They found chunks of the black substance in different places over the course of several months, including next to Hangman Creek (also known as Latah Creek), says Jerry White, Jr., the current Spokane Riverkeeper. In his office, White has a small Ziploc bag with a handful of pieces of coal that the label says were found west of Latah Creek on March 9, 2014. But the small amounts found in Spokane were nothing compared to what people found along the Columbia River Gorge, White says: "It's clear that when you get into the Columbia Gorge, that's where the wind really kicks up." For years, environmental advocacy groups voiced concerns over coal and coal dust blowing off of trains traveling from the Powder River Basin in Montana and Wyoming to terminals in Vancouver, British Columbia. Their worry? That coal is contaminating rivers and waterways along the rail route through the heart of Washington state with mercury, arsenic and other toxins. So in 2013, a coalition of groups — including Spokane Riverkeeper, the Sierra Club, Puget Soundkeeper Alliance and the Natural Resources Defense Council — sued BNSF Railway, alleging that the freight railroad network had violated the Clean Water Act. The case went to trial for a week last November, when scientists testified that coal particles come off of every coal rail car in transit, and eyewitnesses told stories of being pelted by coal from trains passing along waterways, according to a statement from the environmental groups. Soon after, the parties announced that they would settle. With the settlement, filed in court on Friday, March 3, BNSF denies any violations of the Clean Water Act, but also agrees to "remove significant accumulations of coal and/or petcoke materials in areas on or adjacent to BNSF's right-of-way" at several locations along the Columbia River. The company also will study whether covering coal cars would be a viable option. "Really, it is a huge win in terms of getting the industry to look at covering these cars in the long term," White says, "and then picking up these significant accumulations of coal in the Columbia basin." The cleanup sites include Horsethief Lake, the Drano Lake rail bridge and parking area, the White Salmon River and its confluence with the Columbia, the confluence of Rock Creek and the Columbia, and a causeway near Murdock, Washington. Though the cleanups don't include areas close to Spokane, the gateway to the state for trains coming from the Powder River Basin, the settlement is part of "a larger push in a direction to address the impacts of the coal industry on our world in a very big-picture way," White says. "We understood that if we settled, and negotiated with the industry, that we were going to get closer to real, realistic fixes." BNSF also agreed to pay $1 million to the Rose Foundation to fund projects that will improve water quality or habitat in Washington and the Columbia River. It's not clear yet if any of that money will be used for projects in Spokane, White says. BNSF, meanwhile, sees the settlement as a win that "reflects the truth that these sweeping allegations were simply unfounded." "It's important to point out they sued us for $4.6 trillion; that's trillion with a 't,'" says Courtney Wallace, a BNSF spokeswoman. "The settlement is $1 million." BNSF has studied coal dust for more than a decade, Wallace says. After the company had two derailments in the Powder River Basin, it appeared that coal dust was affecting the stability of track structure and integrity of the company's rail lines there. So BNSF required its customers to spray all coal cars with a "topper agent" to prevent dust, and load the cars in a "bread loaf" shape before they leave the basin, which greatly reduced issues with coal leaving the cars, Wallace says. Then, two years ago, BNSF added a "respray" station in Pasco, to spray the coal and petcoke (petroleum coke) cars again, midway through their journey. "We were asked if we would do that, it wasn't a requirement," Wallace says. 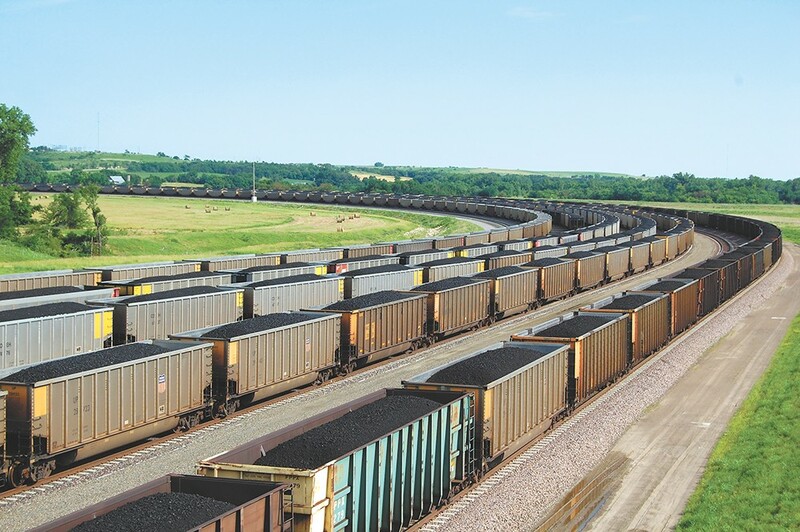 "We spent about $26 million, so now all coal cars going through Pasco go through there." The vast majority of the roughly three to five coal trains per day that BNSF hauls through Washington state pass through Pasco on their way to Westshore Terminals in B.C., Wallace says. Some coal is also hauled to a coal-fired power plant in Centralia. "We do take this very seriously, and continue to study options to make sure we are addressing coal and petcoke in the best way possible," says Wallace. "We want to make sure anything we're moving, including coal, including grain, is moved safely and efficiently, and this is not something we take lightly." Though BNSF is required to study covers for the coal cars, the decision on whether or not to use them will be data-driven, Wallace says. "As far as I know right now, there are no commercially available covers," says Wallace. "One of the important things to remember is the settlement agreement doesn't require a particular outcome for the car covers." Still, BNSF is figuring out prototypes, working with vendors, and plans to put together a protocol to look at their safety and viability, she says. With the settlement, the environmental groups also agreed not to sue BNSF over the issue again for the next five years. "The judge didn't rule there were any violations of the Clean Water Act," Wallace says. "We deny any violations of that. We want to make sure coal stays in the cars."